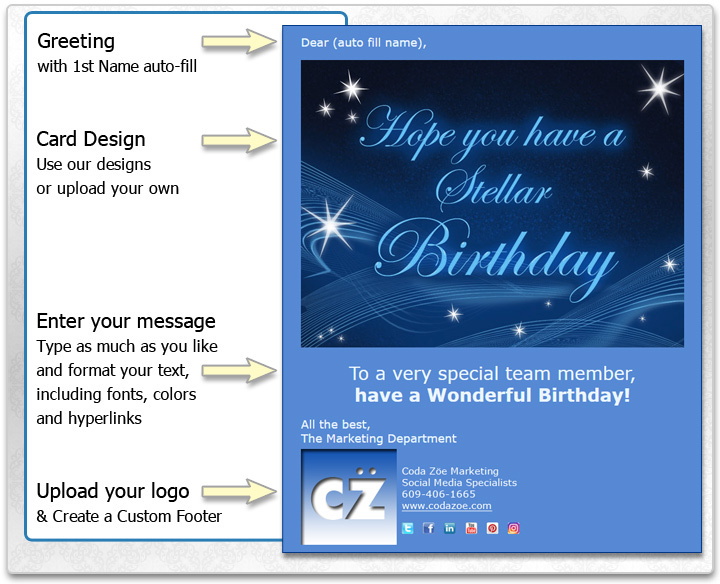 Easily create and send professional, advertising free eCards that can be customized to fit your needs. Whether you're sending one eCard at a time or to a group of people, CorpNote eCards are an affordable way to stay connected with customers, coworkers and friends. You can also share your eCards in social media and from your website. 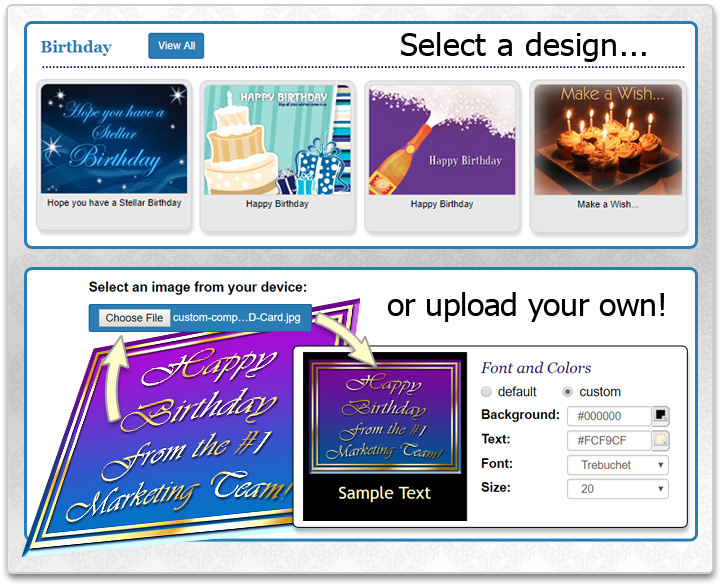 Great for birthday cards, anniversaries, holiday cards and marketing campaigns. Use our recurring eCards feature to completely automate the process of sending holiday eCards, birthday and anniversary eCards, reminders, marketing campaigns and more. Choose one of our designs or upload your own photo or artwork to be used as an eCard or invitation. Type your message and add a custom signature with a logo, contact info and social links. You can track your eCard views in real-time. If the eCard included an invitation or survey, you will also see if people responded. You can also share your eCard in social media and on your website. You can create templates with frequently used messages and easily send your message to a group of contacts. It can literally take 30 seconds or less to send an eCard. Plus, all of our memberships include invitation and survey management to help you easily perform various business tasks. For more detailed information, view our Creating and Sending an eCard / Invitation tutorial. Customize our website with your logo and colors to match your company's identity. 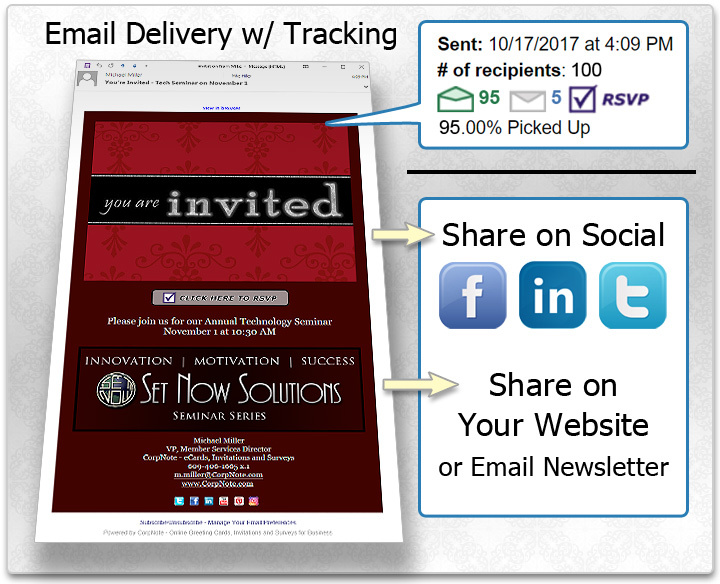 Your company branded interface is visible to you, your members and recipients who view your eCards, invitations and surveys. Consolidated billing and 50% off per user per month when compared to our individual monthly membership rate. Each user has their own private account to manage contacts, eCards, events and surveys. 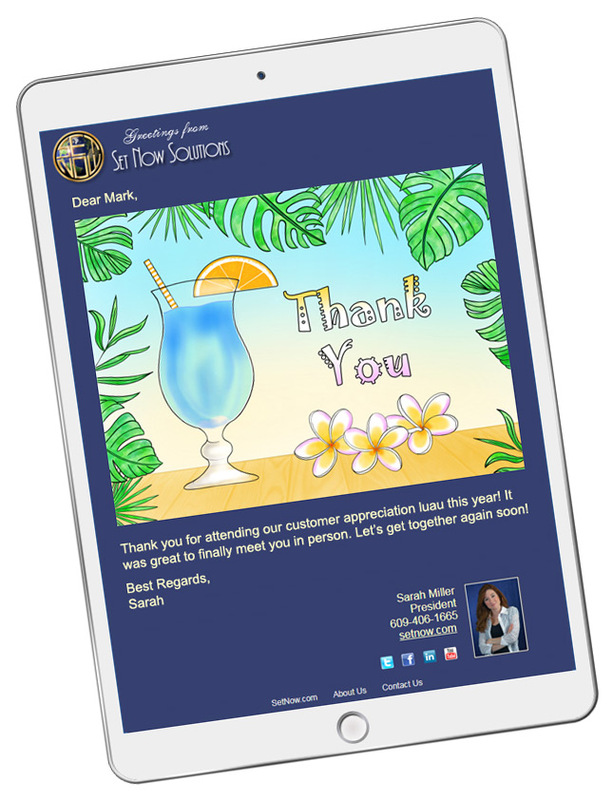 Administrators can share uploaded card designs and templates to ensure brand consistency in your user's communication. General user usage reports and the ability to control which card designs and templates are available to your users is also included. For more detailed information, view our Multi-User Plans tutorial. "This year my office decided to take an eco-friendly, fast approach to extending holiday greetings to company contacts... Using the CorpNote platform was fast, easy, stress free, and it reduced the cost (staff time and funds) dramatically."